Tom Mauer, owner of Weed Man in Springfield-Hartford, Mass., has always had a green thumb. For years, he owned his own independent lawn-care business, but when he wasn’t seeing the numbers he wanted to see, he decided to become a Weed Man franchisee to serve as an add-on for his existing business. This past December, Mauer received the company’s 2015 Award of Excellence and Marketing Performance (over $1.5 million) award. The Award of Excellence recognizes Mauer for top achievement within Weed Man USA, a fast-growing national lawn-care franchise that provides environmentally-responsible fertilization, weed control and integrated pest-management services. This award symbolizes operational excellence and, internally, is the highest honor a Weed Man franchisee can receive. It is a significant milestone that can only be achieved through years of meticulous planning and execution. Below, Maurer describes his journey from humble private lawn-care business owner to the best Weed Man in the nation. 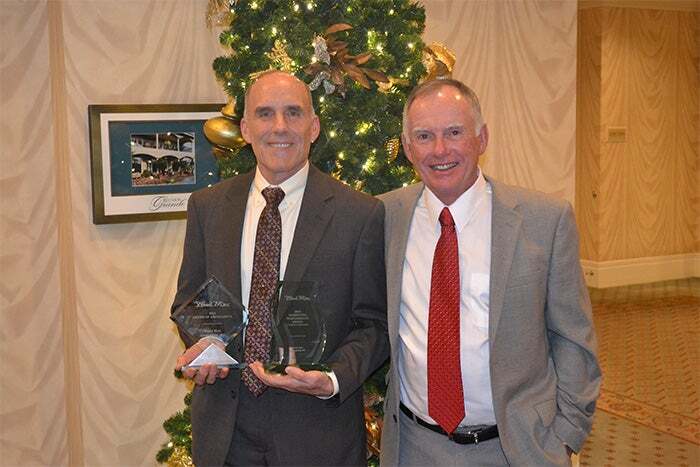 Weed Man franchisee Tom Mauer, left, holds his recent awards with Weed Man founder Roger Mongeon, right. I’ve been a franchise owner of Weed Man Springfield-Hartford for 15 years. I purchased my area in January of 2001. Today, we have grown to more than 5,040 full-program customers and $2.4 million-plus in revenue. Prior to becoming a Weed Man franchisee, I owned a landscape company with my partners. We operated a full-service landscape business -- complete with lawn care, snow plowing, etc. -- and were trying to grow the lawn-care side of our business. We were struggling to achieve our growth marks and had worked with marketing companies, but I wanted more than just good-looking brochures and signage that they provided. I started looking at franchises for help with branding and marketing as well as improving efficiency in our operations. That’s when we were introduced to Weed Man USA and decided to purchase a franchise. I’ve always had a love for the green industry. My partners and I owned the landscape company for 20 years, before we added on Weed Man. Once I saw the depth of support from Weed Man and the experience of the people driving the franchise, I knew I had to make the switch to franchise owner to accelerate the growth of the business. When I discovered that Weed Man offered much more than marketing, I knew it was the right next step for our business. The Weed Man business planning and management systems focus on growing the business and providing great customer service, while increasing efficiency and profits. I had tremendous confidence and trust in the Weed Man staff I met while doing my research. I don’t have an exact cost estimate, but it is based on purchasing an exclusive territory, vehicle and equipment as well as marketing expenses to establish a customer base. I read about Weed Man in trade magazines and online. Then, I connected with others involved in the Weed Man organization, including franchisees. Training my team on the franchise systems and convincing them that following the plan would ultimately help us achieve our goals faster. Research the franchise to know if it’s the right fit for you. When you decide to go ahead, be absolutely committed to following the plan and systems. Trust the franchise -- there is nothing to be gained by trying to do it on your own when you have proven tools and processes to grow your business. I was recently honored as Weed Man USA’s 2015 Award of Excellence recipient and received the Marketing Performance (over $1.5 million) award at the company’s annual conference. Both awards are testament that I made the right decision to go with Weed Man to achieve the business growth I was seeking, along with the support system of meticulous planning and marketing plans. We recently purchased an additional franchise territory and are expanding our service area. With continued growth, our team is excited about new opportunities for employees to grow with the company. As we develop our people and build bench strength in our staff, we plan to look for additional areas to consider for expansion.